Everybody acknowledges how important it is to get children away from their televisions and computers and playing outside; and most parents feel happiest with their children playing in their own back garden. However, a worrying statistic reveals that 125,000 children are injured playing in their gardens each year. In some devastating cases, children lose their lives due to accidents caused playing outside. Luckily, child-proofing your garden only involves some simple steps and common sense to ensure the environment is as safe as possible. Firstly, it is important to make sure that your garden is secure. Younger children especially may not understand the dangers of venturing outside of the garden, and even may see it as an exciting adventure. Therefore, ensure that any gates leading out of your garden are bolted, and that walls are not low enough to be climbed over. If your garden is surrounded by hedges, then these should be checked regularly to make sure there are no gaps or holes which children could squeeze through. Any visible spaces can be patched up with chicken wire or trellis. Garden surfaces are one of the main ways in which injury can occur. Falling onto cement or gravel will inevitably lead to cuts and bruises that could upset both you and your children. Placing play equipment on grass is a sensible idea, though this could still be potentially dangerous if the ground is hard in areas, or if the grass recently got wet. The most effective way of making your garden a safe playing area is to install specially-designed Smartplay safety surfacing. This will even out any uneven ground in the garden and cushion any falls or trips. You should also teach your children the dangers of particular plants found in the garden. Some plants and bushes will have thorns and other sharp bits which would hurt a child if they fall into them or try to touch them. Nettles are also an unpleasant thing which kids should be made aware of. Young children especially should also have it reiterated to them that they should not attempt to eat anything in the garden. Some berries and plants can be poisonous, or at least are likely to cause an upset stomach. Particular danger could arise if any plants have been treated with chemicals such as weed or pest killer. You should make sure that any chemicals such as these are also kept well away in a garage or within the house where youngsters cannot easily access them. 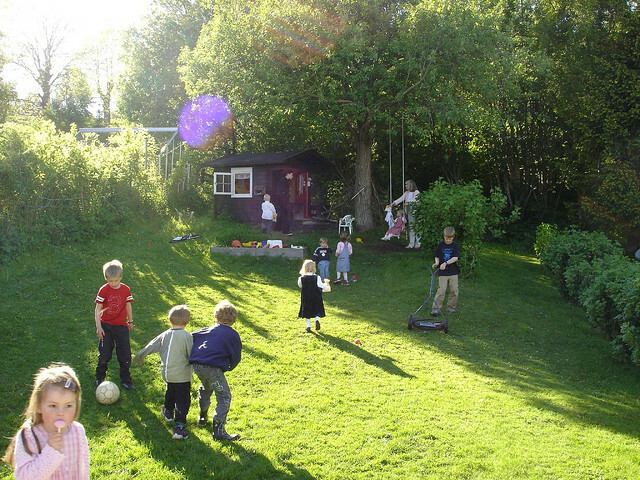 Outdoor play is essential for your kids, and they should be encouraged to do it. Worrying your children about danger can be damaging to their confidence; but gently teaching them basic safety tips while ensuring all of the necessary steps are taken yourself will give you both peace of mind while playing.